My experience has been that Long Point Bay is a relatively safe place to boat. The wind and wave protection afforded by Long Point provides for superior Lake Erie boating and swimming conditions. However, the same sand formations that make for great recreation can also make for hazardous boating. The sandbars in Long Point Bay can change location from year to year, are sometimes very near the surface, and in some cases, extend miles from shore. The following list of hazards includes some sandbars that I would recommend that you locate (by means other than hitting them at 35 mph) and avoid. Bluff Bar (the second sandbar) is in the Outer Bay and is several miles in length. It originates at the Point and hooks back in a northwest direction. It is marked by several green marker’s including the green buoy listed in Stomp’s Waypoints, which marks its west end. This bar is ankle-deep in sections! There may be places where it can be safely crossed, but I would recommend going around and not across. On several occasions, I have witnessed boats steaming across Bluff Bar and then coming to an abrupt halt as they drive into the sand. Bluff Bar is particularly dangerous as it prevents one from hugging the shoreline when heading to the end of Long Point. It is seemingly “out in the middle of the lake” and rises up quickly from 20 to 25 ft depths to less than 3 ft. If you’re heading to or from the lighthouse, determine where Bluff Bar is and make sure you avoid it. 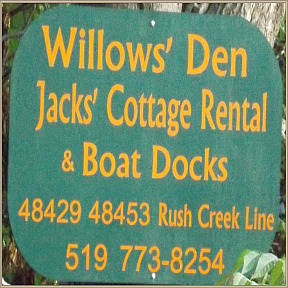 The First Sandbar runs between Turkey Point and Pottohawk Point and is the boundary between the Inner and Outer bays. The are two channels, the North and South channels which allow for passage over this bar. The North Channel is the much deeper of the channels and is clearly marked by several buoy pairs. The South Channel is not marked and is harder to find. The South Channel is not for use by novices or in low water conditions (including high wave conditions) This bar is very shallow in places, particularly around Pottohawk Point. Locate the channels and use them for passage across this bar. The Sandbar at the end of Long Point extends out from the tip, continuing as an underwater extension of the Point. If you’re boating in this area, watch your depth finder or the water for signs of this sandbar. If you’re downrigging in this area, keep on eye on your sonar and be prepared to raise your cannonballs when you pass the end of the Point. The waters off the North Beach at the end of Long Point hide a series of concrete groins. These structures extend out from the beach into the lake. Exercise extreme caution when approaching this area. Commercial Fishing Nets are often found in the Outer Bay. They are usually marked by a tall black flag at either end and by a series of cans which extend the length of the net. The nets generally run in a north-south direction and can extend for long distances (1000’s of ft). I have crossed these nets between cans, as the netting is submerged well below the surface. Be on the lookout for nets when downrigging and steer well clear of them. If your fishing equipment becomes entangled in a net, a good general rule may be to cut your lines and try to recover your equipment from the commercial operator. Gas Well Markers – now usually marked by a single white stake with a red tip. These well markers are found throughout the Outer Bay and can be confused with gill net markers. It is possible to get downrigging equipment hung up on a well marker so don’t get too close if ‘rigging. To minimize the risk of encountering the above hazards obtain and study a chart before venturing out on the Bay. A depth finder with a shallow alarm can be very helpful, as can a GPS unit.